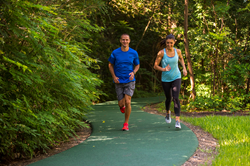 The hotel property's resurfaced jogging trail is perfect for fitness-minded travelers, and feeds to the crushed granite Memorial Park trails adjacent to the hotel property. The track runs throughout the Houstonian’s campus and also feeds into to Memorial Park’s longer trails. The Houstonian Hotel, Club & Spa, known as an ideal property for fitness enthusiasts, has now added a .8-mile, state-of-the-art jogging trail to its list of amenities for hotel guests. The Forbes Travel Guide Four-Star, urban retreat is located minutes from downtown Houston, the Galleria and Memorial Park. Its 175,000 square-foot, private Houstonian Club is available with no resort fee for hotel guests and offers fitness-forward equipment, over 180 weekly fitness classes, aquatic programs, an indoor tennis facility, and three resort pools. The jogging path was resurfaced as a high-tech Rubberway training track comprised of recycled rubber tires on top of a concrete slab base layer. The base layer gives it more resilience, protecting walkers’ and joggers’ joints and ligaments from the long-term impacts of exercise while also preserving trees and preventing trip hazards. The track runs throughout the Houstonian’s campus and also feeds into to Memorial Park’s longer trails. Featuring water stations, fitness zones and plenty of nature along the way, this one-mile trail is an ideal tool for those wanting to move their exercise outdoors. Rubberway’s tracks provide an ergonomic, safe, effective, and environmentally friendly walking and jogging service. These quick-drying tracks also provide storm water management and allow for rapid filtration and drainage of water. Even with the concrete base layer, the Houstonian’s new track still drains horizontally and vertically. World Recycling Surfacing Group president, CEO and founder Karoleen Alexander, who also invented rubber sidewalks in 1989, first developed the Rubberway track system in 2000. “The Houstonian selected this model because it’s a porous, environmental, and sustainable option that many people are interested in, because it provides storm management in an ADA-approved ergonomic fitness option,” Alexander said. As the trail winds through the property, hotel guests can enjoy a quiet canopy of trees on one end, and a great view of the club's tennis courts, pools and Trellis Spa on the other. The 2.9-mile, crushed granite Memorial Park trail can be accessed via two routes from The Houstonian entrance. The Houstonian Outdoor offerings are many, and a Houstonian Walking & Jogging Map can be obtained at the hotel Concierge Desk.